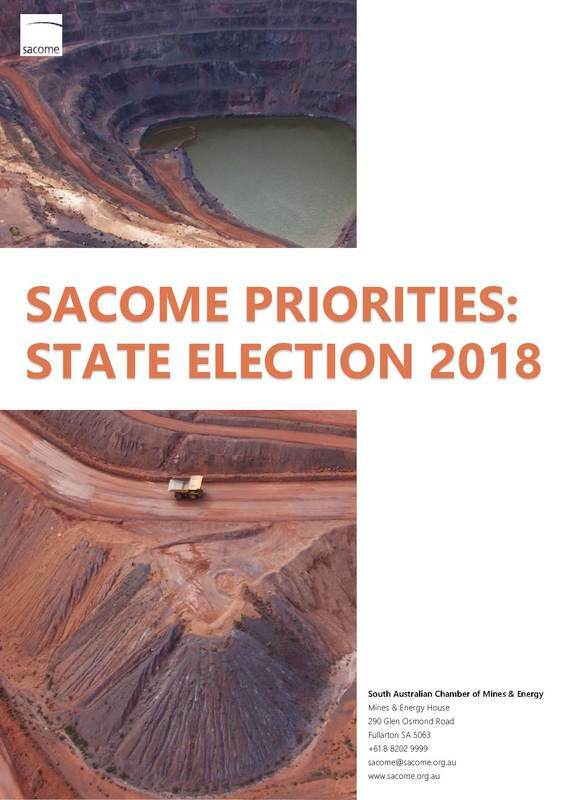 The South Australian Chamber of Mines and Energy (SACOME) has today published its SACOME Priorities – State Election 2018 document. SACOME has been actively consulting with its membership, through its committees, to establish key priorities that that will underpin the industry’s position to key decision makers, as we move into a critical political period in South Australia. Rebecca Knol CEO SACOME said “The importance of the resources sector to the South Australian economy cannot be overstated. With a portfolio that represents 34% of the state’s exports, generating $208 million in royalties and employing 26,700 people; prosperity for South Australia and the resource sector are inextricably linked”. Reject all moratoria on resources exploration and development in South Australia. Increase economic development opportunities for the state through improved Woomera Prohibited Areas access arrangements. Increase PACE Minerals funding to incentivise ongoing mineral exploration in South Australia. Create economic efficiencies for the resources, agricultural and freight sectors through the duplication of the Joy Baluch Bridge and increased vehicle flow. Facilitate the development of critical port infrastructure, including development of deep water ‘capesize’ port to increase South Australian export capacity and drive efficiency across the resource supply chain. Facilitate the development of electricity transmission infrastructure to enable South Australian resources projects. Greater collaboration between federal and state governments to develop nationally cohesive energy policies. Ensure continued investment in electricity storage options that improve reliability of the South Australian electricity network. Ensuring an ongoing supply of affordable gas for South Australian industrial, commercial and domestic uses. Ensure the regulatory structures governing the resources sector are efficient, reflective of industry practices and facilitate industry activity through completion of the South Australian Leading Practice Mining Acts Review process. Ensure that processes governing land access arrangements in South Australia are transparent, evidenced based and strike a balance between land holder rights and land access for the resources sector. Commit to the completion of Environmental Protection and Biodiversity Conservation bilateral agreement processes. As the leading industry body representing the resources sector SACOME is actively engaging with political influencers to seek commitment to its priority agenda. Click on image above to read SACOME's priorities.